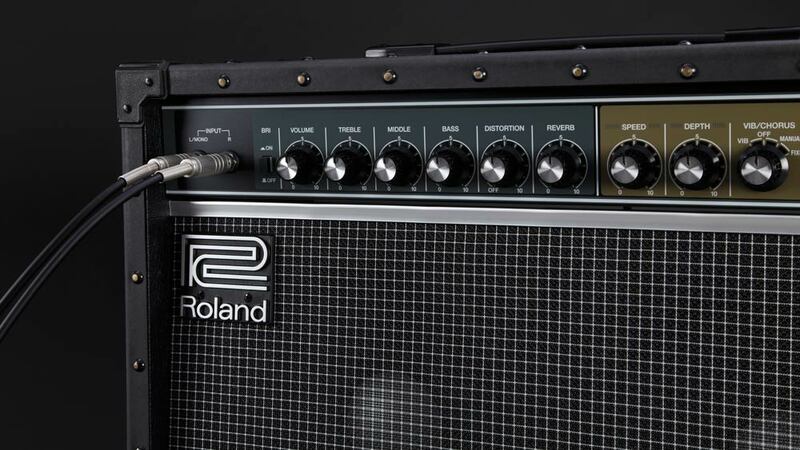 First appearing in 1975, the Jazz Chorus series was designed from the outset by Roland’s engineers to be the best in clean guitar amplification. Now celebrating its 40th anniversary, the JC sound has been heard on generations of hit records, and remains first-call for players, engineers, and producers that want the ultimate in clean tone. Roland JC-40 (front) alongside the flagship JC-120. 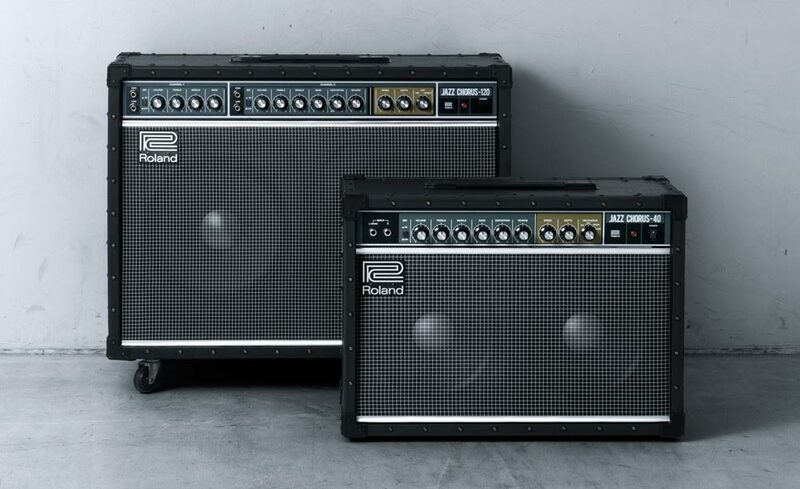 Scaled down from the flagship JC-120, the JC-40 offers 40 watts of stereo power with two independent amp sections and custom-designed 10-inch speakers. The compact size is perfect for nightclubs, theaters, and small halls, and great for studio work as well. The JC-40 also features the unmistakable look and rugged construction of its big brother. No matter what style you play, the flexible JC-40 delivers the tone you need. The full JC clean tone preserves the natural character of your instrument, and it’s ideal for accurately hearing the sound created by stomp effects, amp modelers, and guitar synths. And with the three-band EQ and bright switch, you can quickly adjust your overall tone to suit any playing space. Front panel of the Roland JC-40. The JC series is also renowned for its built-in Dimensional Space Chorus, which operates in true stereo for a one-of-a-kind spread unavailable in other single amps. Of course, the JC-40 is equipped with this standout feature, and offers new fixed and manual modes for increased tonal range. The amp also includes vibrato and reverb effects, and both operate in stereo for rich, deep performance. There’s built-in distortion as well, like the JC-120. For the JC-40, the distortion has been updated with a smooth, satisfying tone that’s great for all types of music. 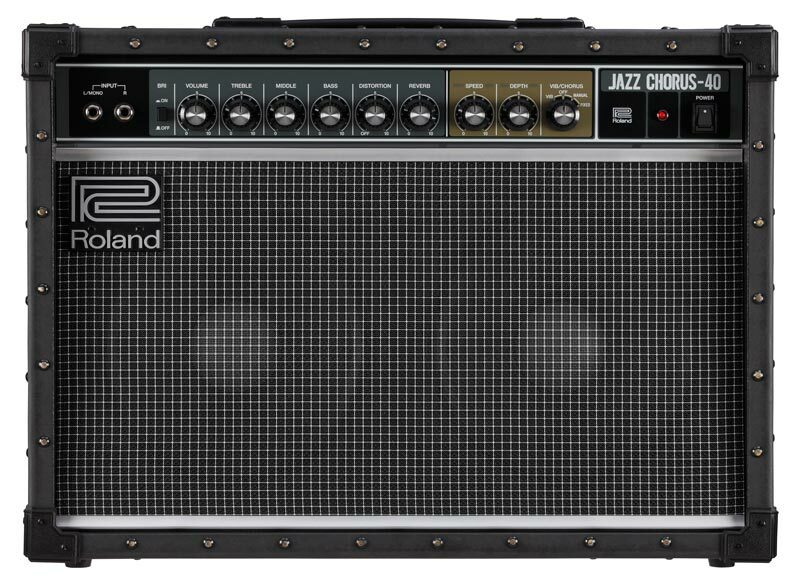 The JC-40 offers the classic look and rugged construction of the Jazz Chorus series. In addition to a normal mono input, the JC-40 is equipped with a true stereo input, a unique feature that’s a first for the long-running JC series. This is ideal for use with stereo effects, letting you get big, wide sound without lugging around two separate amps. Beyond stomp effects, it’s also great for gear that employs amp modeling, multi-effects, and/or synth capabilities, such as the GT-100, SY-300, GP-10, and ME-80 from BOSS and GR-55 guitar synth from Roland. The JC-40’s front-panel stereo input is great for use with stereo effects, amp modelers, and guitar synths. The JC-40’s rear panel is outfitted with all types of connectivity. The effects loop works with mono or stereo devices, and offers selectable serial or parallel operation. Line Out jacks provide a convenient mono or stereo feed to a mixing board or recorder, while the headphones jack is great for quiet practice. You can also connect optional footswitches to turn the JC-40’s chorus/vibrato, reverb, and distortion effects on/off while performing. The JC-40’s rear panel is filled with connectivity options. Visit the JC-40 product page to learn more about this cool new compact amp.